What Kills Bed Bugs and Their Eggs Instantly? A study published in the Journal of Economic Entomology showed that bed bugs rank #1 amongst the most difficult pests to get rid of, so there’s no wonder why so many people are looking for ways to kill bed bugs and their eggs instantly. The resurgence of bed bugs over the past 15 years in the U.S. combined with bed bugs being more resistant to a wide range of pesticides has left many frustrated and stuck dealing with bed bug infestations. 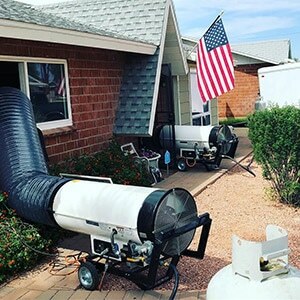 But you don’t have to deal with this infestation much longer… There’s only one fail-proof way to get rid of your infestation in just one day, and that is through a bed bug heat treatment. Although a heat treatment is costly, it is the #1 most effective way to instantly eliminate your bed bug infestation and stop the bites. At Phoenix Bed Bug Expert, we have found out that a heat treatment is by far the most effective way to eliminate a bed bug infestation. It works instantly – killing all bed bugs ane eggs on the day that we perform the heat treatment. Heating infested furniture or entire apartments to a very high temperature will kill all bed bugs and their eggs. We will be heating each room of temperatures ranging from 130 to 150 degrees. No bed bug or egg will be able to survive. While some homeowners may try using hand-held steamers or electric heaters, they are not powerful enough to expose the cold pockets in your furniture. A professional heat treatment will give you the long-lasting results. Our bed bug experts know how to properly provide heat treatments without missing a spot. You can have complete peace of mind that we will completely eradicate your bed bug infestation. Another treatment we offer is a bed bug chemical spray. Our pesticide/chemicals do not work instantly as the heat does. WIth our chemical treatments, every bed bug must come in contact with our pesticide. Any eggs that have been laid will also need to hatch and they will also need to come across the chemical. This entire process can take up to 30 days. Our systematic process of heat treatments, on the other hand, will leave the entire home bed-bug free immediately on that same day of treatment. In addition, a heat treatment comes with a one year warranty/guarantee. If you see any bed bug during your warranty period, we come out to re-treat at no additional cost. – Heat can penetrate cracks and crevices you cannot reach in any other way. The lethal temperatures start at 117 degrees. Our target heat is 130 or 150 degrees for the purpose of killing bed bugs in all of their stages, including eggs. – Another advantage to a bed bug treatment is how safe it is. There does not have to be any use of pesticides/chemicals. – A heat treatment can take 6 to 8 hours, but it sure beats waiting 30 days for a chemical treatment to eliminate an entire bed bug infestation. – After our treatment, there will not be a single bed bug in sight. If you attempt to deal with bed bugs through some of the common DIY methods (killing bed bugs by hand, laundering, vacuuming or applying insecticides), you will have to go through the process multiple times and you still will have bed bugs. A single heat treatment will be sufficient to get rid of the pests and you’ll get a one year guarantee. If the bed bugs return during the period covered by the warranty, you’ll get a free of charge treatment. Bed bugs are resilient little creatures that multiply quickly and that can go a long time without having a meal. Removing a bed bug infestation from your home can be a lengthy process, unless you choose the right professionals for the job and you opt for a thorough, heat-based bed bug treatment.